Working Capital Conversations looks at sustainability. We all know that with the global economy, cross-border transactions have all but erased traditional boundaries. We know what these changes have meant for finance, technology, trade, operations and more. But what about sustainability? As sustainability has evolved from a nice to have – from a cute addition to the annual report or an easy way to appease angry shareholders – and into a core business strategy central to profitability, how have global realities affected the way businesses consider exactly what sustainability means? In an interconnected world, how do successful businesses address sustainability today? These are among the questions addressed in a recent MIT Sloan Management Review report. And the answers may surprise you. 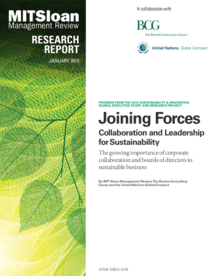 “Joining Forces: Collaboration and Leadership for Sustainability” was prepared through a partnership of the MIT Sloan Management Review, the Boston Consulting Group and the United Nations Global Compact. One of the named authors is Martin Reeves, senior partner and managing director at the Boston Consulting Group. He also leads the BCG Strategy Institute globally.